THANK YOU to all participants for a GREAT TIME at MINImeet 2004! Our 2004 event has now concluded successfully! 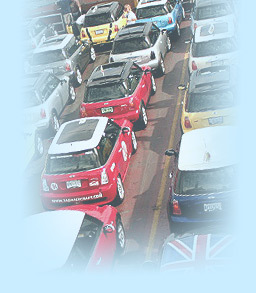 • Please share your suggestions and thoughts for MINImeet 2005 in our discussion forums! Hey MINIacs  MINImeet 2004: The Wolfe Island Adventure! A MINIamazing event for MINIs in Ontario, New York, Quebec, Vermont, Michigan, Massachusetts and Connecticut! See the events page for all the details. Download the Event Schedule & Registration Form (in PDF format, 500 Kb). Print it, then fax it back and you're in. MINImeet is a fantastic grass roots event, organized by MINI enthusiasts, just like you. 2003 was our inaugural event  and it was amazing! (Check our photo gallery to see just how amazing it was!). And now you can join us at MINImeet 2004! Meet some fantastic MINI people, have an amazing weekend and (the best part) boot your MINI around Shannonville Motorsport Park in a Track Experience Day! This is the event your MINI wants to attend! See the events page for all details. Download the Event Schedule/Registration Form (in PDF format, 500 Kb). Print it, then fax it back and you're in. (Well, maybe  we're limited to 60 MINIs. MINImeet 2003 was oversubscribed, so please enter early). There's lots of great stuff planned, including a Headquarters Hotel, Island box lunch, a special Kingston Show 'n Shine event, evening barbeque and some great entertainment. And we'll be setting another MINI Record on the Wolfe Island Ferry! Shannonville is super friendly to MINIs! The track rules say no more than 12 cars at the same time, so there will be plenty of laps for everyone. And we're on a bigger track this year. One super straight-a-way coming up! Experienced drivers will assist novices with on-course driving tips. You'll have a blast! MINIacs are expected from Boston, Ottawa, Detroit, Buffalo, Syracuse, Cleveland, Toronto, Montreal and Vermont. There'll be updates along the way, with some surprise announcements. Watch your e-mail as we add more great stuff! Get On The List - REGISTER TODAY!